Whether you already have a dog and are considering getting a cat, or vice versa, it is very important to think about their first introduction. By letting a loose cat and an off-leash dog meet each other in an open room for the first time, you are probably setting up both animals to fail. Instead, plan ahead and take your time. If you’re thinking of getting a cat for your dog or a dog for your cat, it’s important to consider both animals’ personalities. It may be helpful to look for a companion that has already been exposed to the other species in the past. If a dog attempts to aggressively chase, pin, pick up or otherwise “manhandle” any cat, it is best to not even consider getting a cat — or at least to proceed with caution. Additionally, a dog who growls, lunges at or obsessively barks at a cat would probably do best in a cat-free environment. Likewise, a cat who growls, swats at, runs from or hides from dogs would probably prefer to not live with a dog. If a dog loves chasing things, then a fearful, shy cat who runs away probably wouldn’t be the best choice, as it could trigger the dog to chase. Similarly, an energetic cat who runs and pounces would fall into this same category. A better match here would be a calm, confident cat who will not run (in fear or play). If a dog plays roughly, it is best to avoid kittens or elderly cats who can easily be hurt. Instead, stick to playful adults who are interested in play, but are also confident enough to take care of themselves. If a cat is rambunctious or playful, a dog that is playful, but gentle, could be a great option. If a dog or cat is elderly, laid back, quiet or anxious, then a calm counterpart would be best. Avoid rambunctious companions who may annoy, frighten or otherwise bother the other pet. Resident cat to new dog: If you are adopting a dog, you should not take your cat to meet him at a shelter, or other establishment which houses a number of animals for health and safety reasons. Instead, the introduction should take place at home. 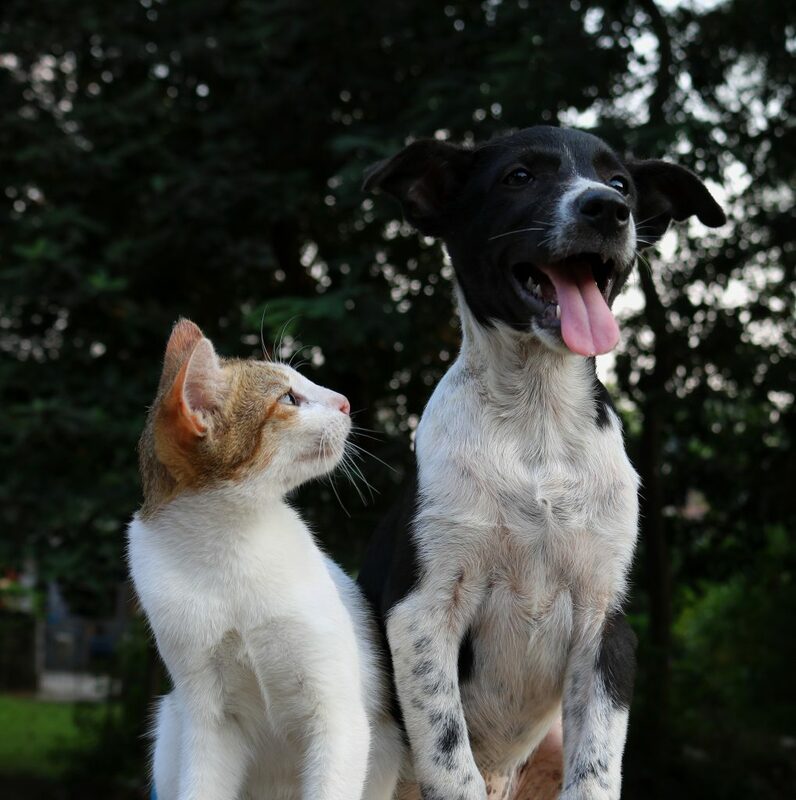 Resident dog to new cat: If you are adopting a cat, do not take your dog into a shelter and expose him to the cats, as this can be highly stressful or traumatic for all of the cats. Also, it is not necessarily a good indicator of how the dog will react at home. Instead, ask the shelter’s adoption counselors whether they have any dog-savvy, confident cats they will allow to meet your dog under controlled conditions. If this is not possible, an alternative would be to have your dog meet a dog-savvy cat who belongs to a friend or relative. As a last resort, you can bring your new kitty home and do an introduction at home. Across a few days, rotate which animal has freedom and which is confined to allow each animal plenty of time to investigate the other one’s scent. Sometimes the dog should be confined to a crate or another room (or taken to another location if he can’t be left alone) to allow the cat time to roam free and investigate the smell of the dog. If the dog stares at the cat or the door separating the cat, try to distract him and get him to look away with treats, a happy voice or by gently guiding the dog away on a leash. Once the dog is away from the cat, try offering a treat. If he takes it, repeat this process until he is no longer focused on the cat or door. If the dog remains overly focused, does not take his eyes off the cat or the door, completely ignores you or lunges suddenly as soon as the cat moves, this is probably a dangerous match. If you are looking for a dog for your resident cat, try another dog. If this is your dog, you should probably not get him a cat. If at any time the dog lunges toward, growls, snaps at or shows any aggression toward a calm, quiet, still cat, this match will probably not work out. The same holds true if a cat attacks a calm, quiet dog. If you are committed to make the relationship work, you will probably need a professional at this point. If you are looking for a cat for your dog, and your dog displays questionable behavior around a cat who is growling, hissing and swatting, try again with another, calmer cat. If he continues to display questionable behavior around multiple cats, it is likely he should not live with cats. If it is your cat who is growling, hissing or swatting, give the cat a break and try again on another day. You might also need to try a different dog. A cat who continually hisses and growls at all types of dogs will likely not want to live with dogs. Your cat may tolerate a dog, but she probably won’t be happy — which is an unfair situation for her. If the cat stops eating, drinking, using the litter box or visiting with family members, she is not happy. You might want to consider finding a better match or contacting a professional animal behaviorist for advice.